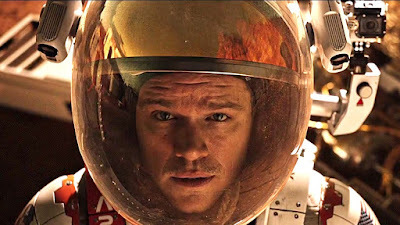 I have been cautiously optimistic with The Martian for some time. Director Ridley Scott just hasn't been on a roll lately. Not only has his films been failures with the fans and critics, but they have failed at the box office as well. Between The Counselor, Exodus: Gods and Kings and Prometheus (which I liked but many didn't), people began to lose faith in Scott. And so did I. Yes, Scott made Gladiator and Alien, but those were twenty, thirty years ago. Has this incredible talent of a director lost his touch? 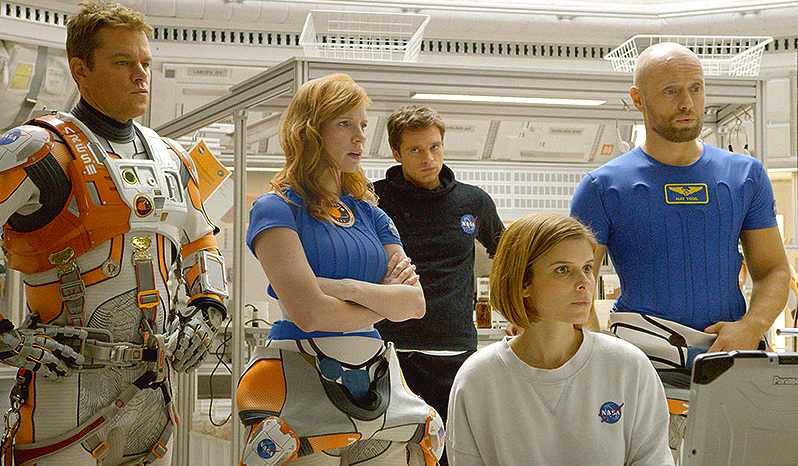 I tried not to get my hopes up too high for The Martian. The trailers looked fantastic, and the cast was incredible, but the same can be said for Exodus. I didn't know whether or not Scott could deliver. Last month we had a similar dilemma with M. Night Shyamalan and The Visit (you can read my review for the film here). Shyamalan hadn't been doing well for a while, and The Visit looked to be his redemption. 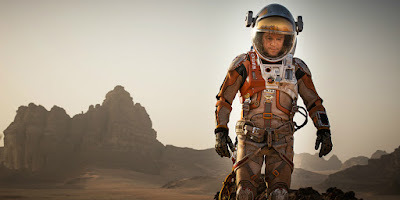 And while Shyamalan failed at making his return, Scott has succeeded with The Martian. 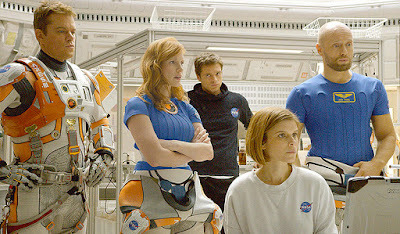 Based on the book of the same title by Andy Weir, The Martian focuses on a Mars expedition, led by Melissa Lewis (Jessica Chastain). When an unexpected storm rapidly approaches, the crew must leave immediately. During the skirmish to evacuate, Mark Watney (Matt Damon) is lost, and the mission leaves without him, thinking Watney dead. On Earth, the head of NASA Teddy Sanders (Jeff Daniels) informs the public of Watney's death, and holds a major, public memorial for him. However, Watney turns out to be alive on Mars. Once NASA learns of this, they scramble to find a way to bring him home. In order to survive, Watney must plan out his rations and come up with a tactical strategy to survive until NASA can save him, that is if they can save him. Everyone was worried before this movie that the trailers had spoiled everything. But in reality, they didn't. Anything the trailer explains is set up in the first twenty minutes of the movie. This film had so many twists and turns. I thought I knew where it was going, and then something would happen and it would completely change. This isn't just a good movie; it's a masterfully directed film. I give full props to Ridley Scott on this one. He didn't just come back: he came back swinging. The film has a fantastic pace. It never rushes and it never drags. It continues on at a very good pace. Fluid is a good word to describe it. This movie is also visually spectacular-- it looks incredible. I couldn't tell what parts of the planet were CGI and what parts were on location, but it all fit together seamlessly. I honestly felt like I was on Mars, and it allowed me to become more engrossed in the film. 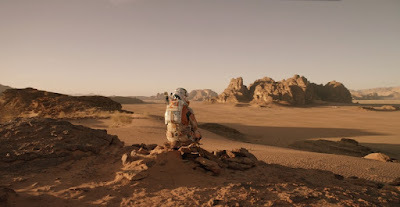 One would think that a movie about an astronaut stranded on Mars would be depressing and dark, but I was surprised with how entertaining and funny the film was. I give a lot of credit to Damon, who turns in a great performance in this movie. He adds energy and life to his character, making it enjoyable to watch. He steals the show every time he's on screen. Not only does Damon act this role well, but his character is also very well written. Drew Goddard did a great job with the script, allowing for us to be entertained by Damon's sarcastic and upbeat nature. Damon knows he's probably going to die, but he doesn't let that consume him. Instead, he actively works to prevent it. While Damon is fantastic in his one-man show, the rest of the cast also bring their A-game. Actors like Kate Mara, Sebastian Stan, Aksel Hennie, Michael Peña, Kristen Wiig, Benedict Wong and Sean Bean are all great in their roles, but Jeff Daniels, Jessica Chastain and Chiwetel Ejiofor really stand out. Some people complain that the shots back on Earth weren't very entertaining, but I was completely engrossed throughout whole film. What made it it work wasn't that they had a scene on Earth and then a scene on Mars, but rather the scenes would be connective of each other. Something on Earth would directly impact Watney on Mars. That way the scenes weren't distracting or unnecessary, but rather pivotal to the progression of the story. What this film really accomplished was that it showed the good side of humanity. The fact that the world would unite, pooling money and resources together, in order to save one human life is refreshing. Daniels has a line in the movie, where he says that this isn't worth "one life", and Sean Bean responds "Yes it is." What this film did so well is that it shows the value of one human life. There were people like Daniels who wanted to leave Watney to die instead of expend the time, money and resources to save him, but ultimately, everyone puts aside their political, religious and cultural differences in order to unite to save one person. And that is very telling of humanity. I didn't have many problems with the movie. The first five or so minutes, detailing the events of Watney being lost and the crew leaving, felt rushed. It was almost as if Scott tried to rush through that set up before he could relax and tell the rest of the story at a much better pace. I wish more time could have been spent setting up the beginning, so that it wouldn't feel so rushed. Some of the side characters also felt unnecessary, specifically Kristen Wiig's character. She really didn't add much to movie, and what lines did help with the progression of the story could have been said by someone else. The problem is that so many of the side characters are played by recognizable actors, that it becomes distracting when they don't have much to do. If they had been played by unknowns, then they would have blended in a bit more, and wouldn't have stuck out as much. 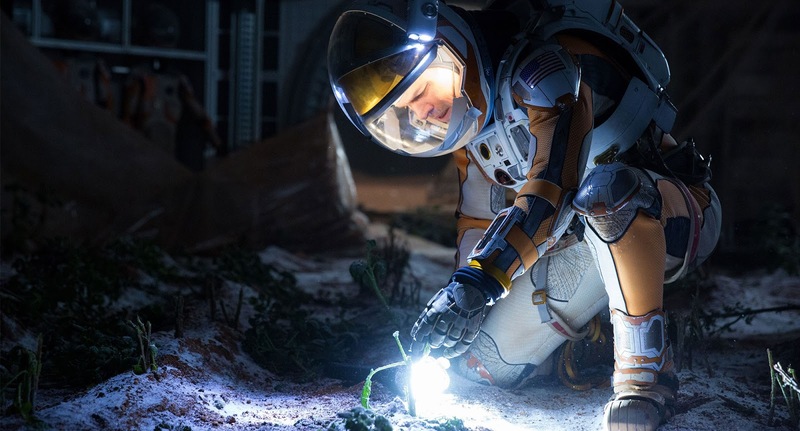 Overall, The Martian hails the return of Ridley Scott. He directs this film masterfully, introducing a steady pace and a fluidity to the movie. Matt Damon is fantastic as Mark Watney, bringing a range of emotions to the character. Between Damon's acting and Drew Goddard's writing, Watney is brought to life in an electrifying and comedic way. The supporting cast is also great, with many talented people in the roles. However, some of these characters could have been removed, since the talent playing them were merely distracting from the immersion into the film. Yet Jessica Chastain, Jeff Daniels and Chiwetel Ejiofor do stand out among the supporting cast as especially elevating. The visuals are incredible, and the design is impeccable. The film's ultimate message about what mankind can do united together also adds to make this an especially important and entertaining film. In the end, this is a really good movie to watch, and one of Scott's best in years. What do you think? Have you seen The Martian? Did you like it? Leave your thoughts in the comments section below.